(Tech Xplore)—City dwellers are not too fond of big trucks moving up and down the streets. Green-minded dwellers are especially reminded of pollution and noise. Trucks in urban settings tend to be low on attractiveness no matter what their essential function. More power to the electric truck, as a concept, making the same people dream of zero local emissions and whispering movements. It's becoming a more likely concept. News in the heavy-duty truck department looks favorable. Mercedes Benz unveiled the electrically powered Urban eTruck. Bloomberg reported the 26-metric-ton Mercedes-Benz Urban eTruck will have a range of about 200 kilometers (120 miles) per battery charge, according to Daimler AG. Darrell Etherington, TechCrunch, considered the benefits. "In addition to emissions and environmental benefits, use of vehicles like the Urban eTruck have an immediate upside for city-dwellers: reduced noise. Anyone who's ever been near a large truck when it trundled down a city street, gearing up from a stop at a traffic light, knows the absolute pain of hearing that huge chugging internal combustion engine wrestling with getting up to a pacing speed." This Mercedes-Benz Urban eTruck enables fully electric transport. "Mercedes-Benz is presenting the first fully electric truck for heavy distribution operations," said the Daimler announcement's headline. UK-based Stu Robarts in Gizmag seemed impressed. Robarts said it "points to a future of zero emission, noise-free large truck deliveries." He said there is an electrically driven rear axle with electric motors adjacent to the wheel hubs. There are three lithium-ion battery modules with a total capacity of 212 kWh. Are electric trucks likely to be on our roads any time soon? Gizmag indicated an optimistic outlook for the future. Robarts said, "until recently, the costs and ranges of the batteries required for heavy electric trucks made them unfeasible. That has since changed, though, and continues to do so. 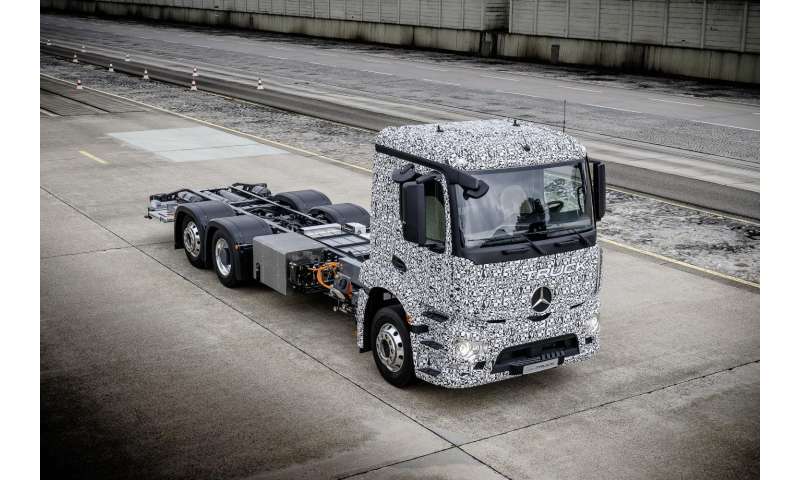 Indeed, according to Daimler Trucks (a sister company of Mercedes-Benz), the costs of batteries is likely to fall by 60 percent between 1997 and 2025 and power is expected to increase by around 250 percent over the same period." Daimler Trucks senses a shift in opportunity. "Electric drive systems previously only saw extremely limited use in trucks. Nowadays costs, performance and charging times develop further so rapidly that now there is a trend reversal in the distribution sector: the time is ripe for the electric truck." Looking at the big picture, Elisabeth Behrmann in Bloomberg said, "Truckmakers are starting to develop electric models to meet tighter emissions rules for city centers, though options are limited due to a lack of batteries with the durability to propel fully loaded vehicles for long periods of constant use"
When will we see Urban eTruck on the roads? Robarts said, "The plan is for the concept to be tested and developed in the coming years, with Mercedes suggesting that the technology could receive a market launch at the start of the next decade." The Daimler Trucks announcement said that a "considerable part of the future investments by the truck division in the fields of research and development flow in the further development of the full electric drive." Cool truck but why the weird paint job is what I'm wondering. Stuttgart could certainly use this - being situated in a depression it tends to get bad smog (not the China kind but still so that you can see it) in an inversion weather setting. They've been trying to prevent this by letting only cars in with low emission (with some success). But something like these trucks (and busses) will certainly be appreciated. "weird paint job is what I'm wondering"